The Four Horsemen have sent a message to fans about the possible MOTU Classics Castle Grayskull playset! Click through to see what they have to say! 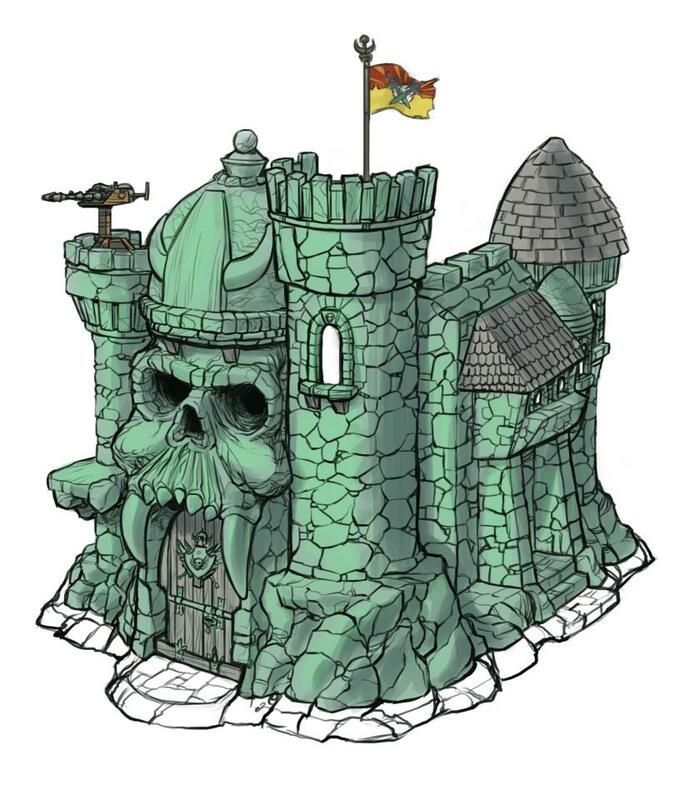 One of the main things we’ve dreamed of doing since we very first pitched the idea of Masters of the Universe Classics to Mattel is to get the chance to re-create one of the most iconic playsets of all time, CASTLE GRAYSKULL! Well, the time has come, and we’ve got the chance to not only re-create Castle Grayskull so that it fits in with the level of detail and styling of Masters of the Universe Classics, but this thing’s gonna be HUUUUGE! Plus, we’re going to include all of the features and fun details of the original, and try squeeze in as much cool new stuff as we possibly can as well. Here’s where you all come in. Unfortunately, this incredible playset isn’t going to be cheap to purchase and we understand that. But the price Mattel’s going to be selling it for is the only way we’re going to be able to make it and get it into the hands of Masters of the Universe fans. Mattel has to have a certain amount of pre-orders before they can even have us start building the thing. If they don’t meet the minimum number of pre-orders required to set this process in motion by the deadline, then Castle Grayskull for the MotU Classics line will never happen. It’s as simple as that. So, obviously what we’re asking from you is, if you can afford it, get over to MattyCollector.com right now and pre-order this monstrosity of a playset before it’s too late. All of the details can be found at this link. You can also watch Mattel’s own Scott (Toy Guru) Nietlich show off a foam-core mock up of the castle in a video he made recently by clicking here. Even though the mock up is very two dimensional, it’ll give you a pretty good idea of just how massive this thing will be when it’s finished! We’re pretty darned excited about the possibility of making this beast of a toy and we’ll promise you right now that if we get to create Castle Grayskull for you, we’re going to put every ounce of heart, soul and creativity into it that we can to try to make it worth every hard earned penny that you’re going to be spending on it. We’ve already been going over the blueprints and planning our direction of attack so when (not if) Mattel gives us the green light we can dive right in. Now all we need is you. This time you truly DO have the power! Thanks in advance. Lets do this, I will be ordering this weekend! As much as i would love to get this thing, i really have no idea how to explain this to my wife. So good luck for you all that it will happen, but i definetly cant´t spend that money. Seems like i do not have the power at all. I told my wife that this will be my X-Mas gift next year from her and it worked!!!! I haven't already ordered it yet because the next 48 hrs will be me convincing her it's my christmas present from her. Ha. My wife has referred to the thermometer on Matty as the "divorce-ometer." Thankfully, she's kidding, lol. She's pretty cool with my hobbies as long as I don't spend crazy $$$. This would normally count, but I'll be buying far less from Matty next year with the price increase. I looooooooove my wife. She encouraged me to get it. She bought me a vintage grayskull for xmas last year. My only regret is that i want 2.